Can an Elf on a Shelf and a Mensch on a Bench see the same view? How about a Fiddler and a Santa on a roof discussing traditions? 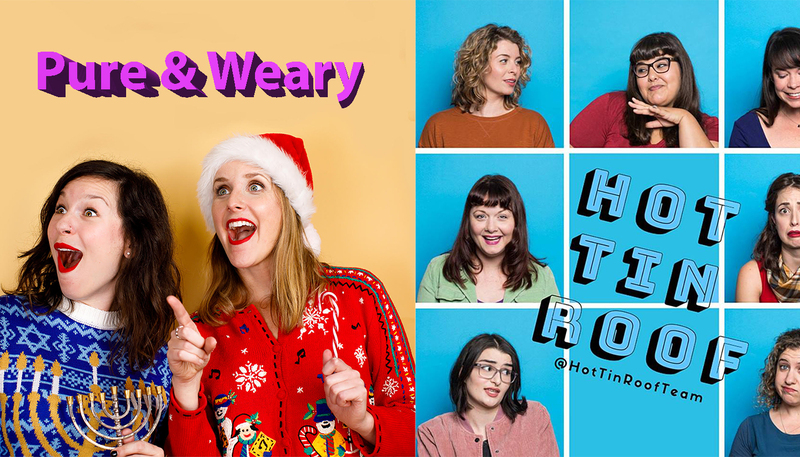 Pure & Weary (Katherine Biskupic & Leah Frires) find a ho-ho-hopeful celebration in times of uncertainty by sketching their way through holiday tales– the old, the new and the Jew. Hot Tin Roof infuse the world with quality comedy and dumb fun laughs! This team includes Silvana Gargione, Gavrielle Harris, Sarah Barenberg, Darby Rae, Chelsey Ireland, Michelle Sims and is coached by the one and only Eileen Montelione.